Get ready to relive the best moments of Breaking Bad before the premiere of Better Call Saul. AMC plans to air two ‘Best of’ Breaking Bad marathons before the return of the drama. The marathons will take fans back in time to see the best of Saul Goodman and Gus Fring. AMC also plans to air season two of Better Call Saul too. AMC released a press statement detailing their plans and revealing the episodes they will air. Check that out below. “In anticipation of the highly-anticipated season three premiere of “Better Call Saul” on Monday, April 10th at 10 p.m. ET/PT, AMC announced today it will air back-to-back episodes of “Better Call Saul’s” critically acclaimed second season as well as two ‘best of’ “Breaking Bad” marathons. The first marathon, on Monday, March 27th, will include select episodes featuring the character of Saul Goodman (Bob Odenkirk) followed by a second marathon on Monday, April 3rd featuring episodes with the villainous Gus Fring (Giancarlo Esposito), who is set to make his first appearance in the new season of “Saul.” Season two of “Better Call Saul” will also become available for catch up on Netflix beginning Monday, March 27th. 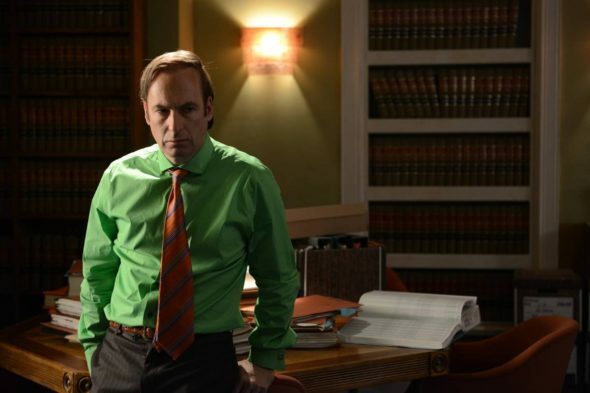 AMC will air a ‘Best of Saul Goodman’ marathon from 9:00am-3:30am ET. “Better Call Saul” season two becomes available on Netflix. AMC will air a ‘Best of Gus Fring’ marathon from 9:00am-2:10am ET. AMC will air back to back episodes of “Better Call Saul” season two from 11:30am-10:00pm ET. Season three of “Better Call Saul” premieres at 10pm ET. Season three of “Better Call Saul” follows the twists and turns of Jimmy McGill’s devolution toward “Breaking Bad’s” Saul Goodman – Albuquerque’s most notorious criminal lawyer. Six years before he meets Walter White, Jimmy is a more or less law-abiding, small-time attorney hustling to champion his underdog clients, build his practice, and somehow make a name for himself. As the new season begins, the repercussions of Chuck’s scheme test Jimmy and Kim’s fledgling law practices and their romance as never before. This imminent existential threat presses Jimmy’s faltering moral compass to the limit. Meanwhile, Mike searches for a mysterious adversary who seems to know almost everything about his business. As the season progresses, new characters are introduced and backstories are further illuminated with meaningful nods to the “Breaking Bad” universe. Are you excited for the return of Better Call Saul? Tell us what you think. Breaking Bad marathon is on right now. Has Better Call Saul episodes already run ? Didn’t get an alert.